We just took a look at Mob Psycho 100 II, so let’s look at another second season of a previous anime! 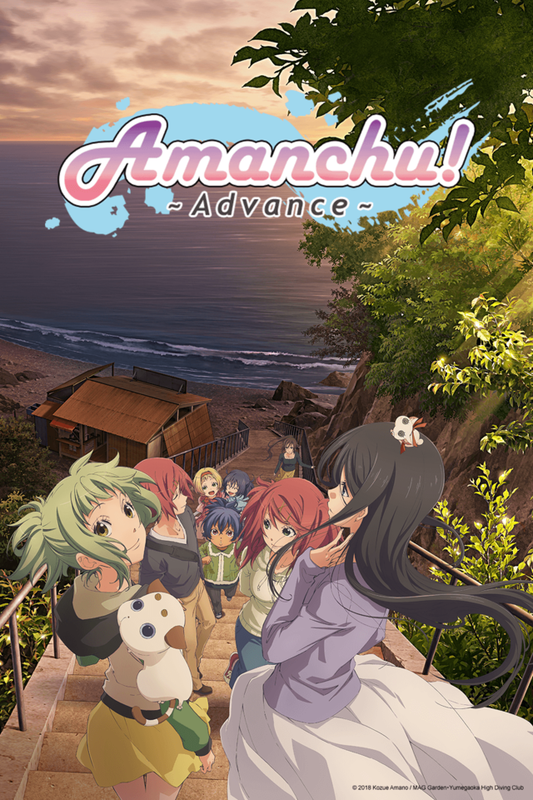 This is the second season of Amanchu!, and came out two years after the first season. Get a feel for what it’s about by reading my review of season one here! Oh dear. Oh my. What happened, and why?! Amanchu Advance is what all otaku’s fear will happen when the media announce a second season. While the first season wasn’t anything spectacular, it had its charms: slice of life schoolgirls coming of age, trusting each other, building relationships, discovering new things, going on adventures! We start off well enough with an episode with diving! Hurray! We also get a lovely conversation between Teko and Pikari regarding anxieties about growing up, and consequently, growing apart. This is a fair exposition point, and there’s a fair amount of foreshadowing with Teko’s retrospective internal monologue. However, this foreshadowing never reaches fruition. There’s nothing that really comes between the two girls, and we don’t get any real stress applied to their relationship. People might argue that the introduction of Kokoro provides tension, as Teko declares her a rival. It’s true that there exists an earned jealous: Pikari is Teko’s best friend. Teko is dependent on Pikari, and feels indebted to her. However, the jealousy is depicted at best as shallow and superficial. Teko’s reactions are inconsistent, and the opportunity for authentic jealousy, self-doubt and loneliness becomes squandered. For much of the season, the show forces a strange ambiguity onto the nature of Teko’s feelings about Pikari and whether they’re of the romantic nature. Eventually, we learn that Kokoro is a boy, and suddenly this changes the nature of his love for Pikari, an archaic stereotype which propogates toxic-heterosexually in the media. Now let’s talk about the pacing, which is horrible. The majority of the season is dedicated to poor allusions which, while make obvious connections to the theme of fleeting youth, does not provide any real resonance. The dream and fantasy devices provide inconsistent realism. This is supposed to be a standard slice of life anime that takes place in the real world. Suddenly, we’re having shared dream experiences. The writers make a bandaid attempt at reassuring us with Teko’s monologue “dreams always go hand in hand with reality”, but this “professional dreamer” business as a way to delve into supernatural genres. It’s unearned and it’s poorly executed. Boo. Yeah, sorry girls: but I ain’t taking off with you. We might be able to salvage the situation by remembering the episode titles have always been “The Story of […]”, which adds a whimsical almost fairy-tale like element. When we juxtapose Teko’s opinions against Mato-chan-sensei’s adult realism, there’s a tiny glimmer of hope. Sensei muses: “when did I stop finding things magical? why did I leave it all?”. That hope is crushed with a Peter Pan story that acts as a poor attempt to make Sensei and Ai more round characters. There’s nothing really learned, no behavior really changed. The entire season is so disorganized, frantic and lukewarm; the fantasy motif was overdone and ineffective. The writers disposed of the good realism points they had created for some cheap allusions that don’t hold any water. And, perhaps the greatest transgression is we bypass practically all of the diving scenes, the plot points of how Teko gets her advanced license. This is where we should have focused, y’all. It’s in the title, for crying out loud! It is nice that they tie in the night diving to the last episode, but it would have made more sense to me for Teko to have at least done an underwater photography course as well. After all, she loves taking photographs, that’s how she saves her memories. So it would make sense for her to take a course which allows her to pursue that element. I could go on about my disappointment, but I think I’ve said enough. The series still has a nice soundtrack and beautiful animation, but ultimately, the series was disappointing. I didn’t really think that much of the motifs being used, like fleeting youth. Good spot. God, that Peter arc is just terrible. Yeah it tried to give Ai and Mato some rounding, poorly executed and just out of place in a show like this. I agree. If I wasnt such a completionist, I wouldn’t have bothered finishing the second season!